Artwork of a Kobble from Donkey Kong Country 3: Dixie Kong's Double Trouble! 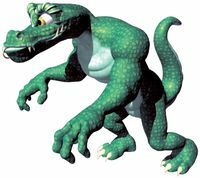 Kobbles are basic, green Kremlings that are used as the soldier grunts of the Kremling Krew, they replaced the Kritters and Klomps of Donkey Kong Country and Donkey Kong Country 2: Diddy's Kong Quest respectively. According to the game's credits, Kobbles belong to the "Kremling Kreeps" enemy class. 1.1 Donkey Kong Country 3: Dixie Kong's Double Trouble! 2.1 Donkey Kong Country 3: Dixie Kong's Double Trouble! During the events of Donkey Kong Country 3: Dixie Kong's Double Trouble!, Kobbles can be easily defeated by any type of attack, and although they look somewhat strongly built, they are not a real threat. Despite being the generic soldier-type, Kobbles are very uncommon in the game, as they only appear in the three Stilt Village levels. In this game, Kobbles behave identically to the way they did in Donkey Kong Country 3: Dixie Kong's Double Trouble!, although in this game they are a far more common enemy, and due to limitations are black and white and made a slight drone noise when defeated instead of the regular Kremling cry of defeat. In the remake of the original Donkey Kong Country 3: Dixie Kong's Double Trouble!, Kobbles return and play the exact same role, except they now have a different voice when defeated, which is a more high-pitched and whiny one, which it shares with the Kritters and Klomps of the Game Boy Advance remakes. Also, the only Kobble who appears in the SNES version of Tidal Trouble is absent in the GBA version, reducing yet more their presence in the game. Unlike their Kritter cousins, Kobbles do not wear clothing of any kind (except for the ring that pierces their lower lips). Skidda, another member of the Kremlings, bears an exact resemblance to Kobble, the only differences being that Skiddas are pink in color and reside in snowy areas. This page was last edited on September 9, 2018, at 12:34.